Are you hosting Thanksgiving, or perhaps a “Friendsgiving” this year? Planning, delegating and cooking can be quite stressful! Something that’s often neglected in the midst of all the Thanksgiving prep is how to set your buffet table. 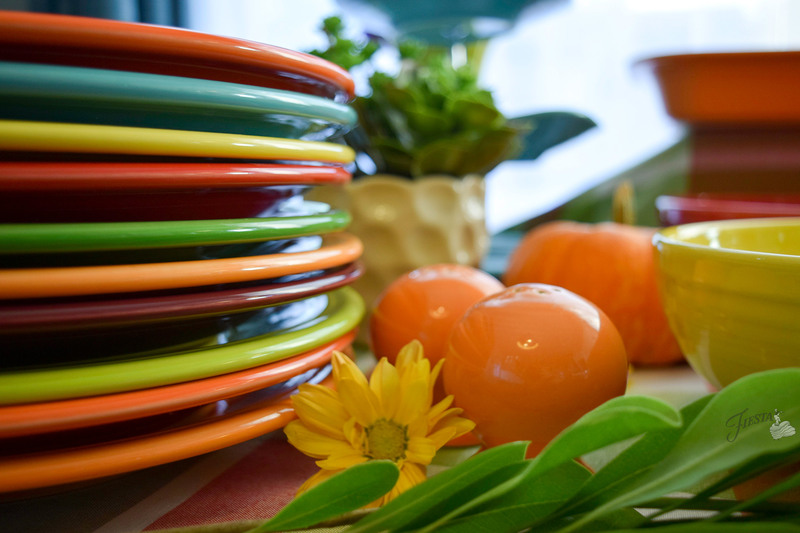 Well, we have your back with a “Guide to Setting a Thanksgiving Buffet Table” that is pretty, colorful and provides a simple flow as your guests load up their plates. It all starts with the buffet table itself. We used a basic six-foot folding table covered with a tablecloth that complemented our color scheme. To add visual interest and height to the dishes toward the back of the table, we placed two boxes underneath the tablecloth. This not only looks more pleasing to the eye, but it makes it easier for people to reach the food that isn’t right up front. Next, we outlined our menu and pulled the serving pieces we’d be using for each dish. 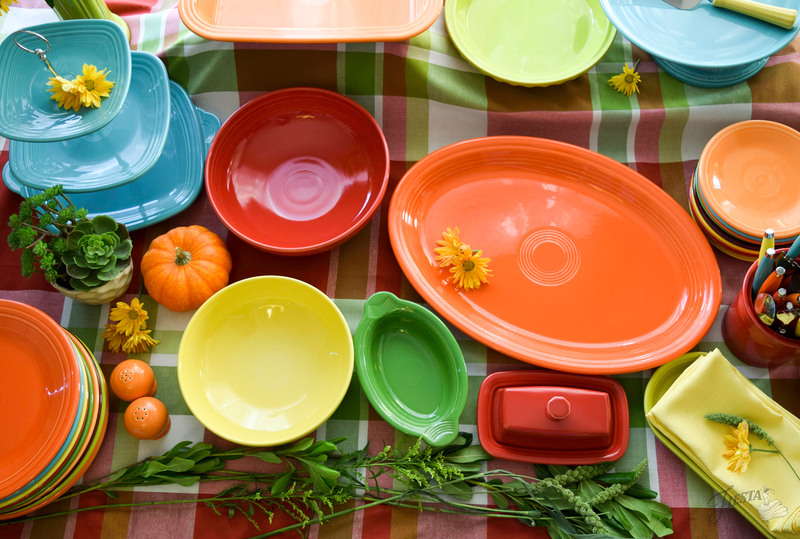 We started with a stack of dinner plates in a variety of seasonal colors: (from top to bottom) Poppy, Turquoise, Sunflower, Scarlet, Shamrock, Tangerine, Claret, and Lemongrass. It’s a good idea to place the dinner plates in the front corner where the buffet line will start. At the center of the feast is the star of the day: turkey! Depending on how large your bird is, we have a variety of serving platters in sizes Small, Medium, Large, and Extra Large. We’re planning for a lot of leftovers, so we used the Extra Large Oval Platter. Condiments like cranberries and butter are next. We used the Individual Casserole for our cranberries and the Extra Large Covered Butter for the butter. 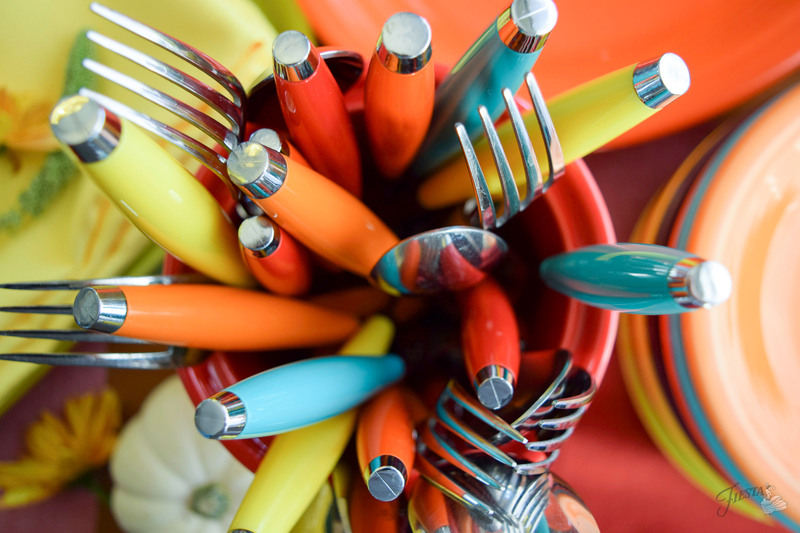 Napkins and flatware are best placed at the end of the line so your guests aren’t juggling them while piling up their plates. Finally, it’s time for dessert. Yum! We made room for a pie and a cake. For the pie, we used the Deep Dish Pie Baker. For the cake, we spiced it up with a little Fiesta hack to create a “plate stand.” We turned a Hostess Serving Bowl upside down and placed a Baking/Pizza Tray on top. 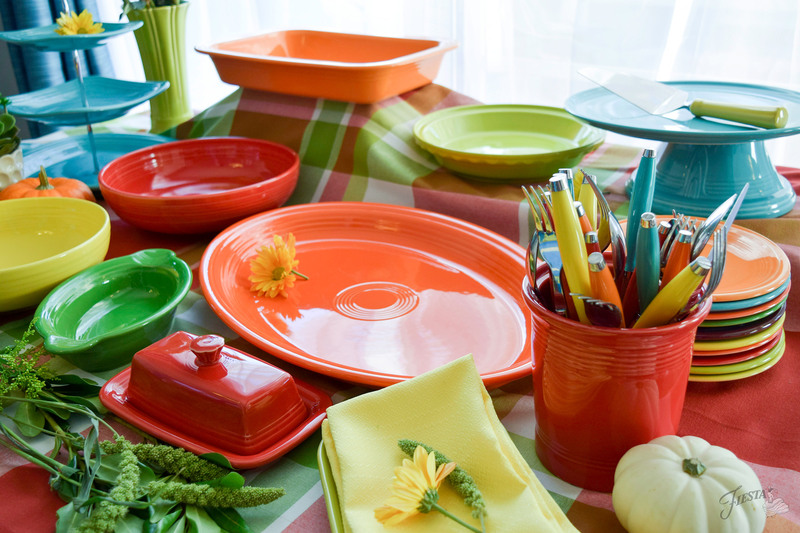 To serve dessert, a stack of Salad Plates finishes off the assortment of dishes. We sprinkled in some mini pumpkins, flowers and greenery to decorate and soften the tablescape. With the buffet table set, we’re ready for full bellies and naps! We’d love to see how you like to set your buffet and dining tables for Thanksgiving. On Facebook, feel free to send us pictures or post them in the comments. Fiesta Dinnerware wishes you and your your loved ones a very Happy Thanksgiving and we hope you take this opportunity to count your blessings. We certainly are thankful for you!